There is one thing the NFL doesn't like to do and that's realign divisions to create new rivalries unless it really has to. If the league did, there would be one match-up that would occur more often than it does. 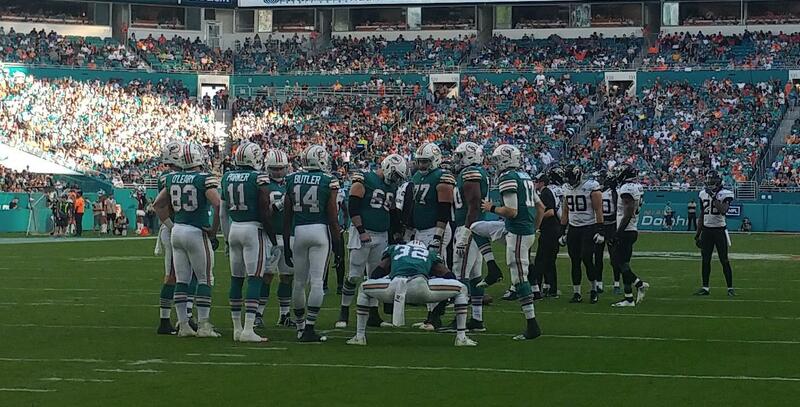 The Miami Dolphins would face the Jacksonville Jaguars. 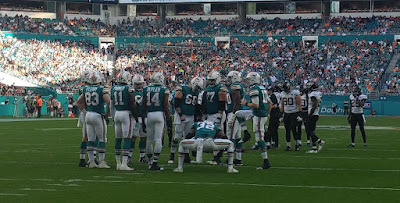 Prior to their game December 23, 2018 game at Hard Rock Stadium, the teams had only met eight times since Jacksonville joined the league in 1995. This game was only the third time these squads ever met in Miami. These teams are less than 350 miles away off I-95. The first time these two teams met in Miami was on December 3, 2006 when Jacksonville left South Florida with a 24-10 win. These squads met again in Miami on December 16, 2012. The Dolphins swam away with a 24-3 win. Jacksonville finished the campaign 2-14 and Head Coach Mike Mularkey was terminated after one season. But for a series with very few moments, there have been some interesting results and connections. First of all, prior to this game, these teams were 4-4 including the playoffs with Miami owning a 4-3 edge in the regular season. There last meeting occurred on September 20, 2015 as the Jaguars won 23-20 in North Florida. But the Jags have owned this series when it mattered the most. Jacksonville thrashed Miami in the Division Playoffs 62-7 on January 15, 2000 in what turned out to be the last game ever for Dolphins Coach Jimmy Johnson and QB Dan Marino. This game was played in Jacksonville. The QB who defeated the Dolphins was Jay Fiedler, who ironically has the same birthday as myself on December 29. He was born in 1971 while I started breathing in 1962. After that win over Miami, he proceeded to sign with the Dolphins inking a three-year deal worth $3.8 Million. He replaced Dan Marino as the starter leading Miami to three 10 plus wins with the team in four years. He had two 11-5 seasons in 2000 and 2001. During his time with Miami, he led the Dolphins to an AFC East Title along with two post-season appearances. Fiedler is the last Dolphins QB to win a playoff game as Miami defeated the Indianapolis Colts 23-17 in overtime on December 30, 2000 at Joe Robbie Stadium. Fiedler would later be inducted into The National Jewish Museum Sports Hall of Fame in 2002. What would or wouldn't we see on this day? We wouldn't see Dolphins future Hall of Fame running back Frank Gore, who was placed on injured reserve. What we would see was a defensive game as both teams were tied 7-7 entering the third quarter until Jacksonville ultimately was led by QB Blake Bortles and it's highly touted defense to win 17-7. The Jags scored a defensive touchdown as Telvin Smith Sr. intercepted a Ryan Tannehill pass 33-yards to pay dirt. The loss dropped the Dolphins to 7-8 and they were officially eliminated from the playoffs. As it turned out, this was the last home game for Miami Coach Adam Gase, who was fired on December 30, 2018 following an embarrassing 42-17 road loss to the Buffalo Bills in Week 17. The Dolphins finished the regular season 7-9. So here we have it, another game in Miami, and two coaches would be fired on that Black Monday named Mularkey and Gase in their respective years, 2012 and 2018. It appears that both starting QB's will be looking for new homes in 2019. There has been talk that the Jaguars are ready to move on from Blake Bortles while the Dolphins have seen enough of Ryan Tannehill. I'll be curious to see when these teams meet again, but you can rest assure for a rivalry that has seen so little, it's seen a lot! The Jaguars now own the All-Time Series 5-4. Jacksonville is 2-0 in games when they punched the Dolphins in the gut. He's the Founder and CEO of South Florida Tribune. He's the Host of The Sports Exchange on the weinetwork.com which airs on Tuesdays and Thursdays from 5-7 pm with Peter Wein. As the year winds down, it's time to reflect and plan ahead. During a recent visit with former College Basketball Coach Mike Jarvis at Dunkin Donuts in Deerfield Beach, FL., we had the time to talk about old times when we worked together as I was covering the FAU Owls. We also talked about plans for promoting his upcoming book, "The Seven C's of Leadership" which I'll get into details at a later date. As I work towards completing my comeback in radio and building my online Publication "The South Florida Tribune" as well as other future endeavors, I looked to Jarvis for guidance as I've tended to do in the past. We talked about what events I'd like to write and talk about in the future? Whether I pull them off is another story, but I'm certainly going to try to work on some of these this year. The QB that gets this process started is my longtime brother from another mother and esteemed colleague George Eichorn. What will it take to get to some of these places and events? For one, good health, and manipulate the finances to make these happen. In order to keep peace with my spouse, I have a feeling that on occasion, I might have to ride solo so she doesn't get upset with me so we can make our annual trips to Michigan and Wisconsin. 1. I've always had a burning desire to cover the Rolex 24 Hour Race in Daytona Beach, FL. That race takes place from January 26-27. To cover an event for 24 hours especially with the adrenaline rush associated with Motor Sports would be neat. This is very attainable. A few hours up I-95 North gets the job done. 2. On the Sports Exchange, we had NHRA Driver and Owner Lex Joon on the program, and we discussed the possibility of me getting involved with The Gator Nationals. This year is the 50th Anniversary of the event and it takes place from March 14-17, at the Gainesville Raceway. Lex and I talked about me getting involved in one of the NHRA Hot Rods. Very attainable! A four hour drive up I-75 North does the trick. 3. I've been talking about this one for the past few years. I've always wanted to see The Jacksonville Jaguars play an NFL Game at Wembley Stadium in England. My Great Friend Dan Edwards (in the photo) has always told me if I can get there, he'll accommodate us. We had this conversation recently and I told him that we need goals and things to shoot for in life. He's just waiting for me to let him know. Besides, my wife would like to tour Wimbledon and explore the history of this historic area. Since I've never been overseas, this would be a great place to start. 4. In 2018, we hit eight Spring Training Venues in Arizona. There are two remaining. The Cubs have a new facility in Mesa while the San Francisco Giants play in Scottsdale. We need to finish this plus see the Milwaukee Brewers renovations in Phoenix and what would a trip to that area be like without seeing My Great Friend, Tim Mead with the Anaheim Angels in Tempe. 5. Why would I want to cover this next event, The CFL's Grey Cup? The major motivation is since I've covered four Super Bowls, a USFL Championship, this will give me an opportunity to cover North America with Pro Football Championships. We've had some CFL guests on the Sports Exchange, now it's time to meet a few. 6. Finally, there are a handful of Spring Training venues left in Florida. But since it's in state, a car trip or weekend is all it takes to get this done. There are other events I'd like to hit as well. I'd like to see a game at Fenway Park in Boston and attend the Kentucky Derby at Churchill Downs. There are lots of new stadiums in all sports around the country, in addition to motor sports race tracks I'd like to hit on the trail, but for now, this is a good starting point. Scott Morganroth can be reached at www.scottsports33.com. He's a member of Detroit Sports Media. His radio show The Sports Exchange can be heard on the weinetwork.com with Peter Wein from 5-7 pm Tuesdays and Thursday. He's also the Founder and CEO of The South Florida Tribune. Before I start this column, I want to wish everyone a Happy and Healthy New Year! Tis the time of the year where you better cash in on your tax write offs. And collect that last cash which will determine your yearly earnings. We all expect coaching turnover the day after the NFL season ends. This is called "Black Monday." In the past 24 hours, there have been some unexpected jobs that came open in collegiate sports. On Sunday, The Miami Hurricanes got a surprise they didn't expect. After watching his football team get thrashed by the Wisconsin Badgers 35-3 in the Pinstripe Bowl on December 27, 2018, Head Coach Mark Richt abruptly announced his retirement. I was hoping that when we got credentialed for the Hurricanes opening game against Savannah State University 77-0, that there would be an opportunity to write a story on Richt, who was coaching at his alma mater. But thanks to some shoddy PR work by the Hurricanes Sports Information Staff, that never came to fruition. Richt's story appeared to be a good one since it reminded me of Jim Harbaugh's return to Michigan. Before I get to Richt's successor, let's go to the numbers. In Richt's three years with UM, he had a 26-13 record. His tenure started 19-4, but ended 7-9. Miami ranked as high as No.2 and it seemed like UM was on the road to national prominence. In the end, the Hurricanes never seemed to develop a QB which was Richt's former position. You have to have a signal caller and that seemed to be the downfall. After the Hurricanes pounding of Savannah State on Saturday, September 8 2018, the most energetic person in the post-game press conference was Defensive Coordinator Manny Diaz. A couple of weeks ago, Diaz was hired as the new head coach at Temple University. He decided to coach the Hurricanes in their bowl game in New York. When Richt's announcement came, there would be names mentioned as his successors. Former Hurricanes Coach and current FIU Boss Butch Davis, Oregon Coach Mario Cristobal, who coached at FIU, and former NFL Coach Rex Ryan were prominently discussed. But to the Hurricanes credit with the cooperation of Temple University, Diaz didn't have to move up I-95 to Philadelphia to coach the Owls. Instead, he was offered and accepted his dream job in his hometown of Miami working at a Power Five School, albeit with no head coaching experience. Now he has the task of trying to resurrect a program that has failed to win an ACC Championship and attempt to fill a stadium which is tough to do when you're winning. Diaz, who created the "Turnover Chain" will have a lot of links to connect to bring this program back to prominence which Howard Schnellenberger originally turned around. I really thought Richt was the guy, but now he'll get to ride off into retirement world, though I do feel he quit on this program and had left unfinished business to take care of. Although, he did donate $1 Million to finance a badly needed Indoor Practice Facility. Nonetheless, I wish him well. Another Coaching move that stunned me this morning was UCLA deciding to fire Head Coach Steve Alford. Alford was hired by the Bruins in March of 2013. During his first season in Los Angeles, he went 28-9. Alford made appearances in the Sweet 16 three of four years at the helm, but were eliminated as part of the First Four in last years NCAA Tournament. Alford's stint at UCLA ends with a 124-63 record including a 55-35 mark in conference play. UCLA has started 7-6 and was on a four-game losing streak when Athletic Director Dan Guerrero decided to pull the plug on his employment. During that losing streak, the Bruins lost at home to Liberty, and Ohio State while also falling to Cincinnati by 29 points. Alford will have no problem landing another job down the line. Alford's all-time head coaching record is 587-298 with a .663 winning percentage. His stops include Division III Manchester, Southwest Missouri State, Iowa and New Mexico before landing at UCLA. On a future Sports Exchange Show, I hope to land former UCLA Basketball Play-By-Play Announcer Chris Roberts to talk about what it's like to coach at Westwood in the shadows of iconic Coach John Wooden. He's a member of Detroit Sports Media and is Co-host of The Sports Exchange on the weinetwork.com with Peter Wein that runs on Tuesdays and Thursdays from 5-7 pm. He's also the Founder and CEO of The South Florida Tribune.